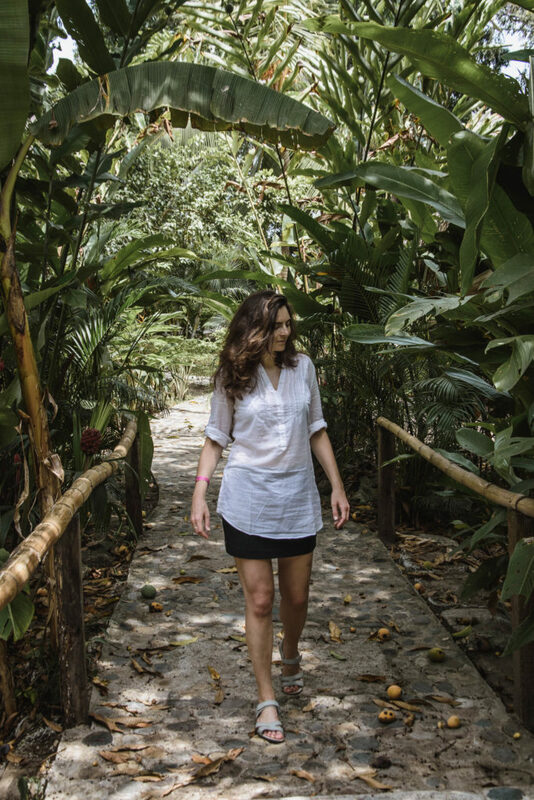 When traveling through Colombia, you don’t want to miss this natural beauty on the Caribbean coast. 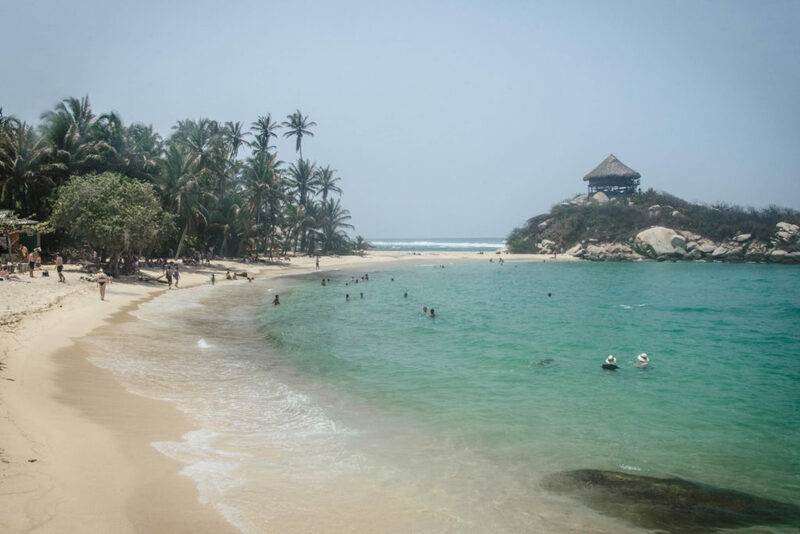 Tayrona National Natural Park is a stunning combination of wild jungle and paradise golden sand beaches and one of the best national parks in the country. 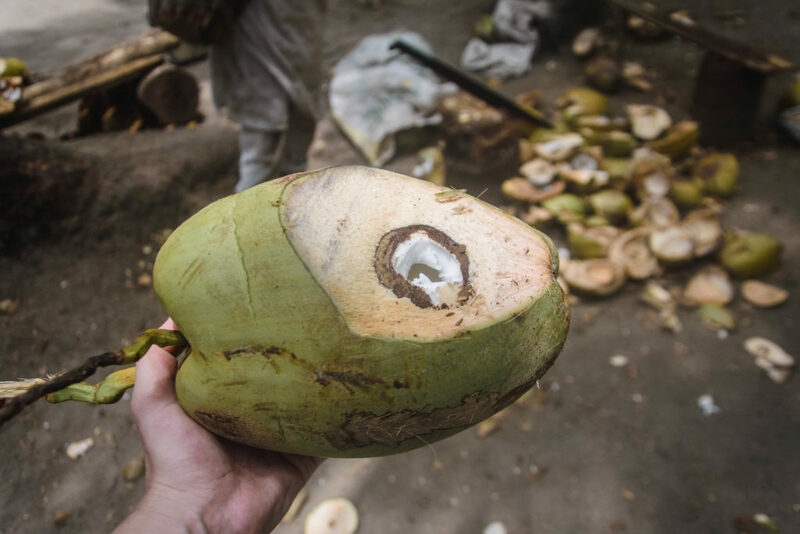 It is not a surprise that it is so popular both among foreigners but also among locals. 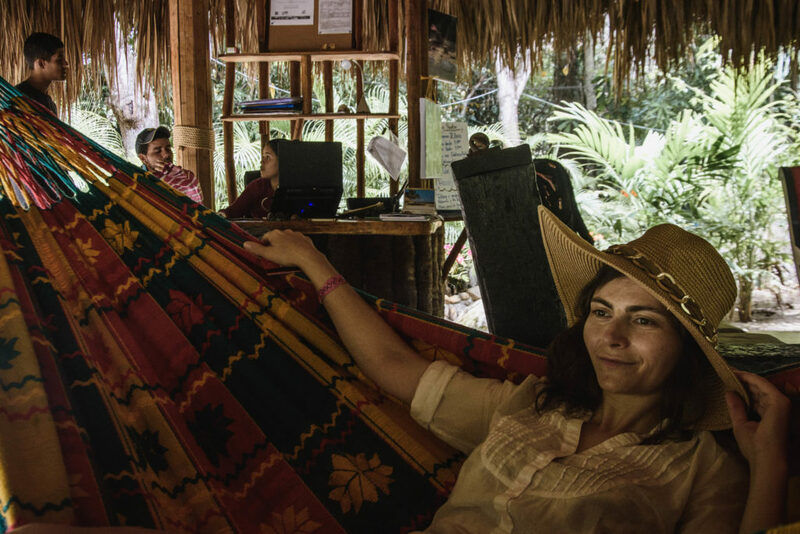 Besides the fact that nature and landscape here are stunning, it is a wonderfully relaxing place – especially after visiting busy cities such as Cartagena, Medellín or Bogotá. The natural park covers approx. 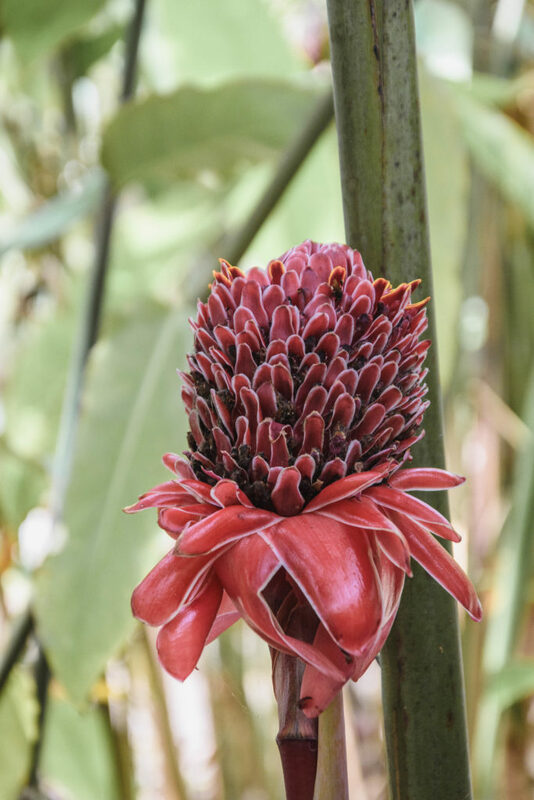 30 sq km of the Caribbean Sea and 150 sq km of land and is a vast natural habitat for hundreds of species of plants and birds, but also different species of mammals, reptiles, amphibians, fish, corrals and much more. 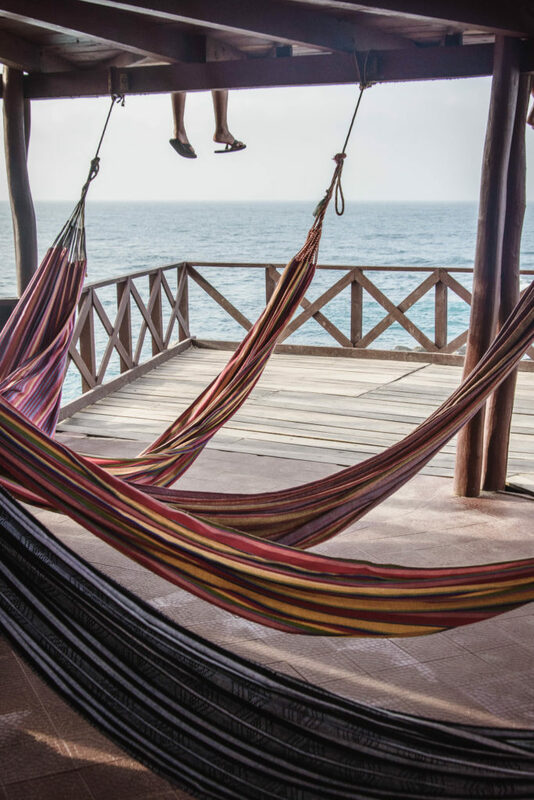 If you get to visit the beautiful but touristy Cartagena, it would be a pity to miss this paradise located only a few hours bus drive from there! 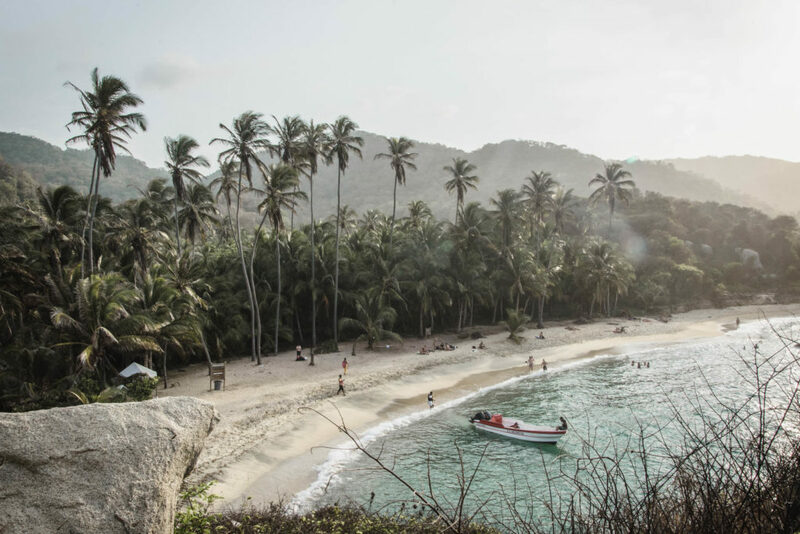 Due to the Caribbean tropical weather, Tayrona is an all year round destination, just be aware that during the main season, the walking paths and beaches inside the park get pretty crowded. 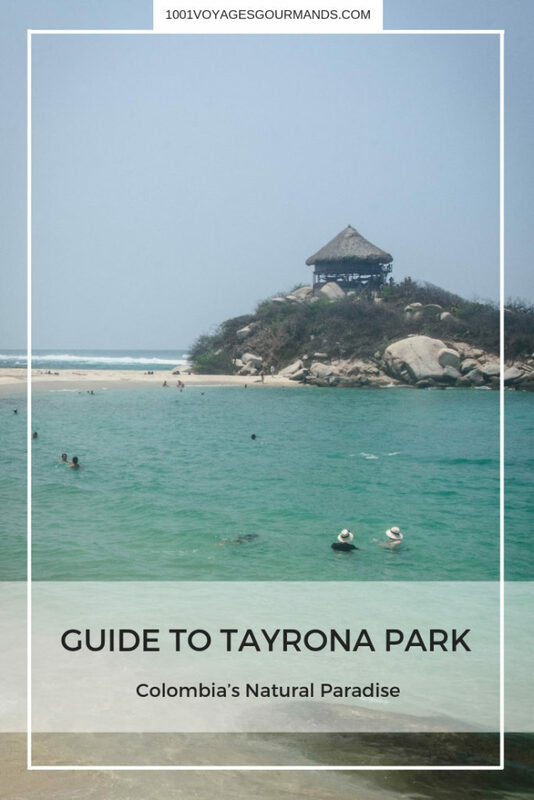 Upon our research and visit last year in May, I put all the useful information together and wrote this Quick Guide to Colombian Paradise in Tayrona Park. I hope you find it handy! 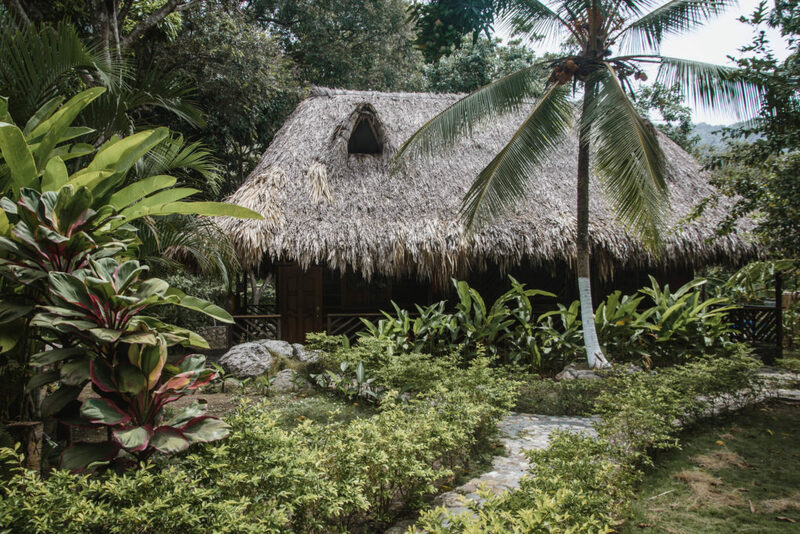 Santa Marta is a good base for the exploration of the park. 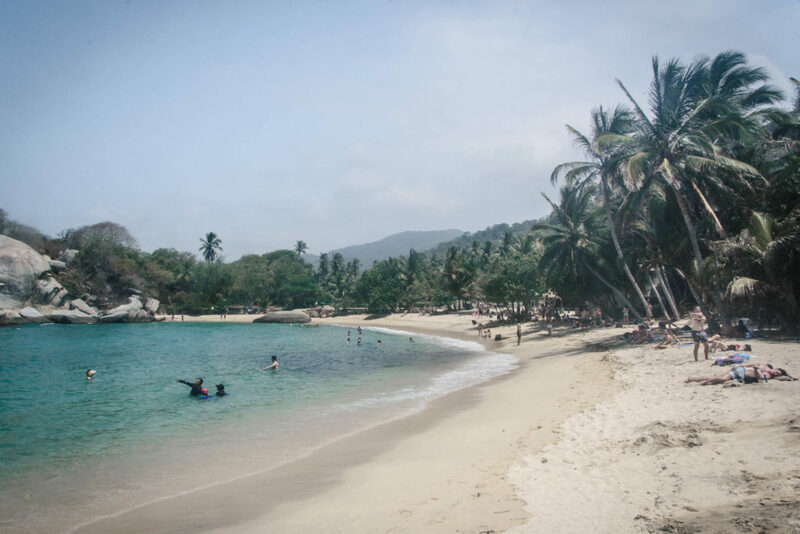 You can get there easily by bus from Cartagena which takes about 5 hours (Colombian time, so expect more in your reality, to be safe) with companies such as for example Marsol or if you come from another part of Colombia, you can also simply take a plane as there is an airport in Santa Marta too. 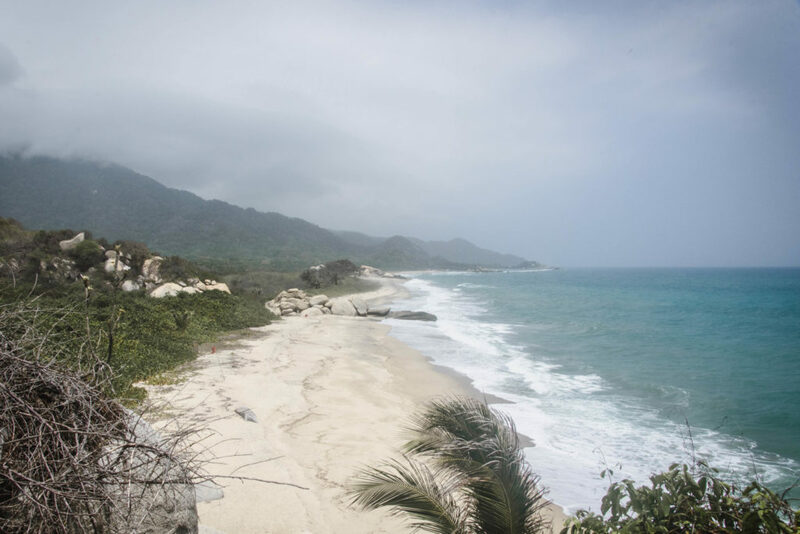 Another solid base is Palomino, located about 70 km from Santa Marta direction East from the park. 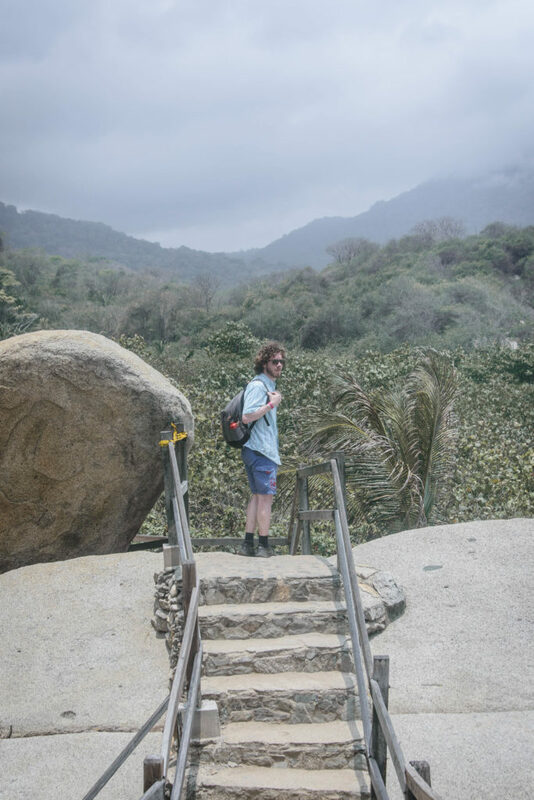 In order to visit the park, you just need to take a collectivo from Santa Marta to the main entrance to the park which takes about an hour and is very cheap. At the main entrance, you will need to pay an entrance fee while showing your passport or a copy of it, so please have it with you, ok?! 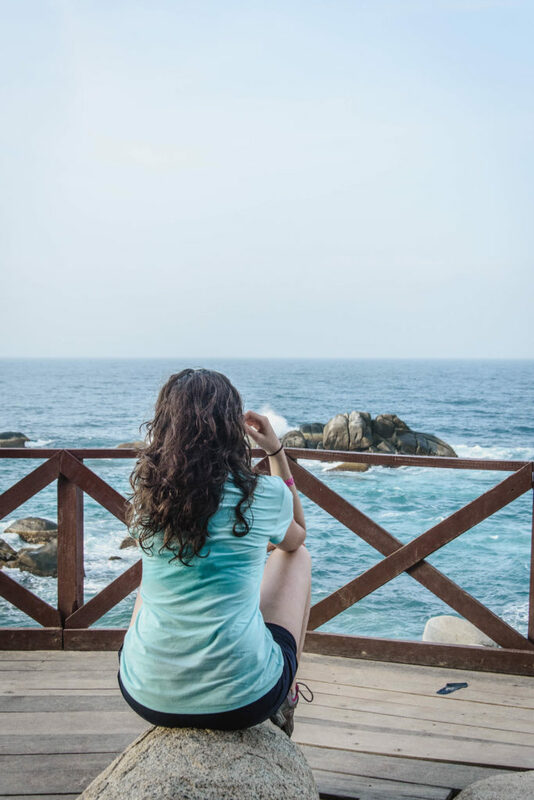 If you don’t feel like going alone, beware that many hostels located in Santa Marta organize day trips to Parque Tayrona including some activities. 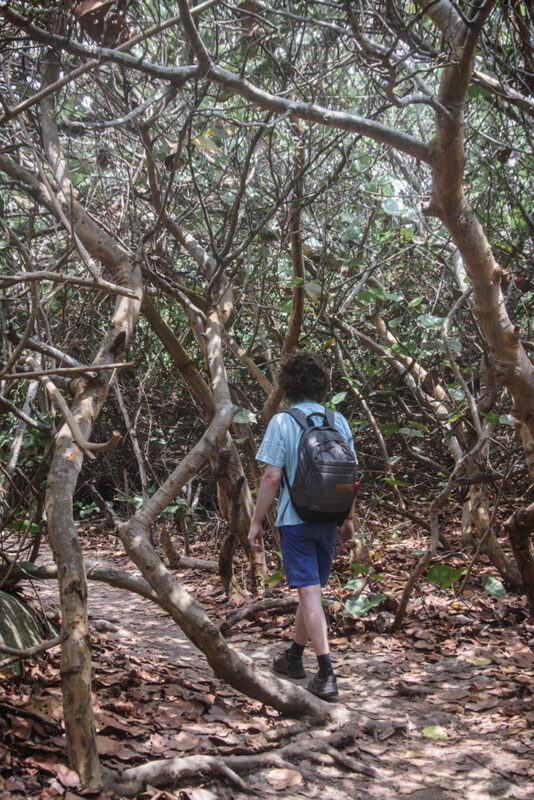 Follow the path through sandy beaches and tropical forest – it is quite easy to walk. Although it doesn’t look like on the map, some distances are quite big. If you don’t feel like walking and sweating for 2 or more hours, consider hiring a horse. Remember it is very hot and humid, so have enough water with you. 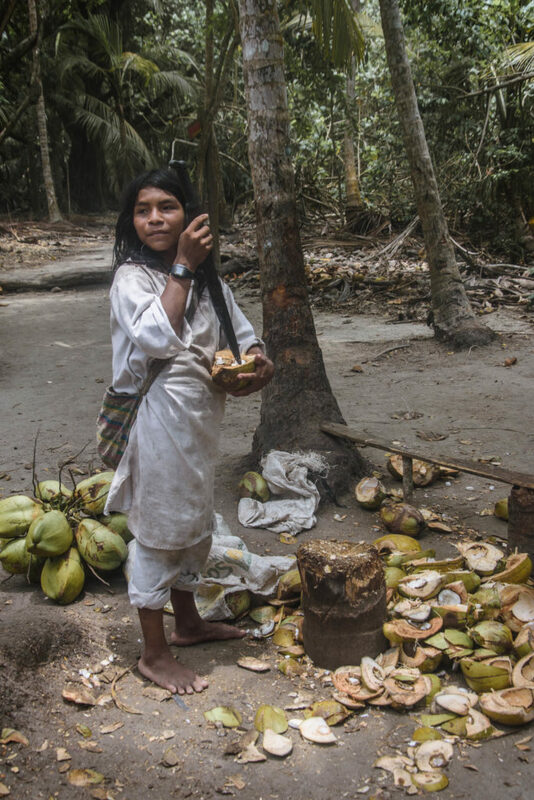 You will probably meet the local Kogi people selling coconut water in the forest which is very refreshing. 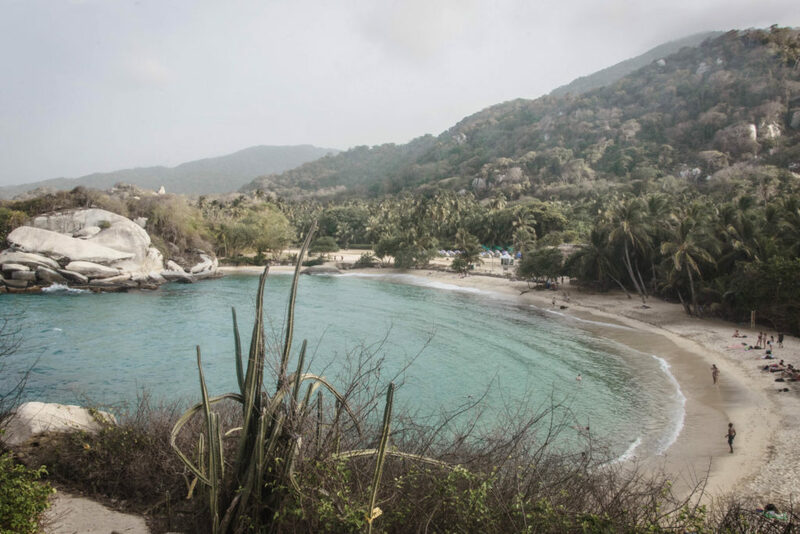 Within the coastal part of the Tayrona park, there are several stunning beaches where you can get some rest and enjoy the natural beauty here. The most popular ones are Cabo San Juan, Cañaveral, Arrecifes, La Piscina or Playa Cristal. But beware that many beaches here are not good for swimming! 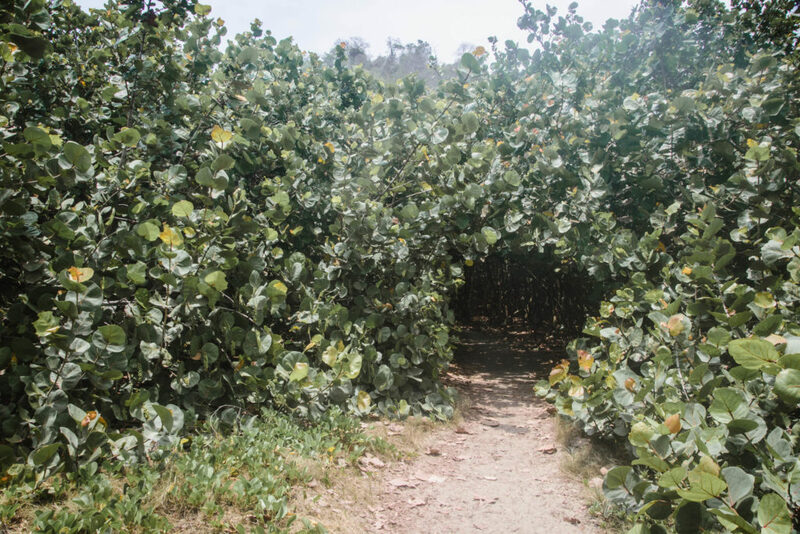 For us, swimming was key so we directly headed to Cabo San Juan which is only 1.5-2 hours’ walk from the main entrance in the Eastern side of the park. 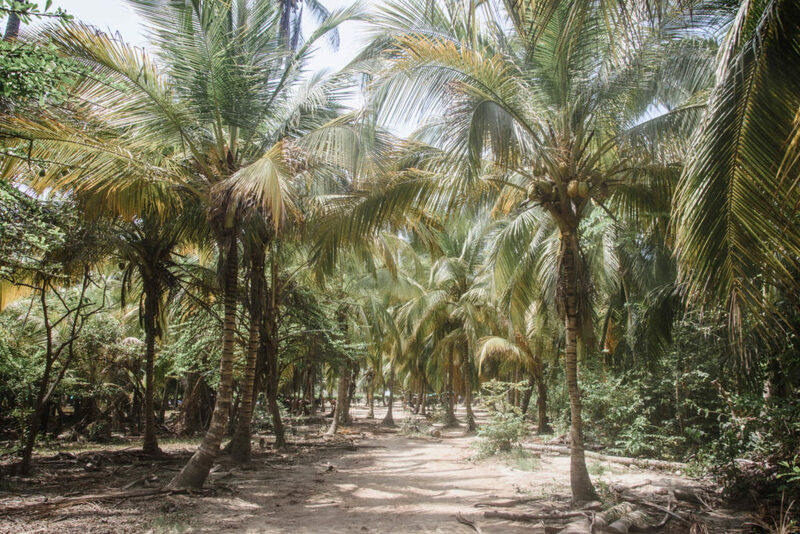 You can also walk through the Pueblito from the Western side and it will be more or less the same distance. Another beach suitable for swimming is La Piscina. Sunblock – always wear sunblock as the sun is strong there! If you plan to take a bus from the end of the hiking trail to the main entrance, check out the schedule and see when is the last bus (usually it leaves around 6), otherwise it’s still one hour walk on the road, which is nothing stunning to enjoy. Do not swim at beaches which are not suitable for swimming! 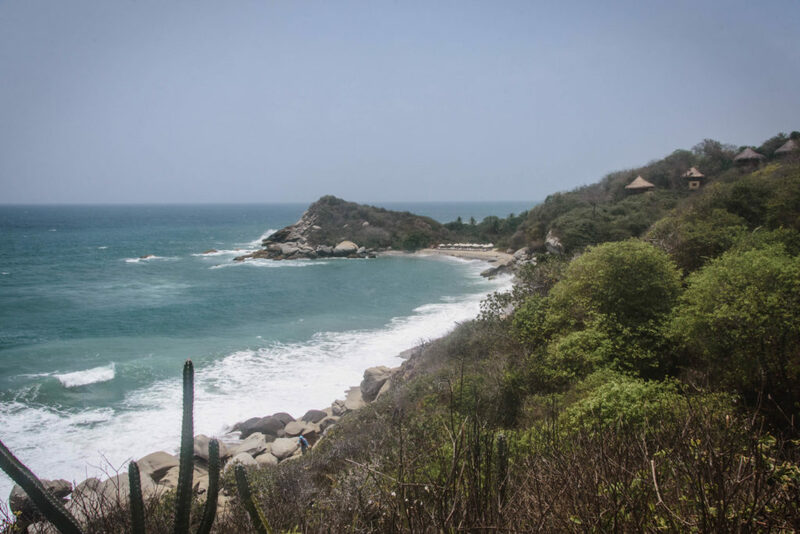 At many places in Tayrona Park, there is a strong riptide with extremely dangerous under-currents. Many people already lost their lives there and you still want to see the rest of Colombia, right?! In terms of dangerous animals, beware of snakes in the area, especially after it gets dark! According to the locals we met, the snakes go out after the sunset as people are leaving, and we even saw people killing some little but dangerous ones on a parking spot! Mosquitos are present also, so take your DEET repellent! 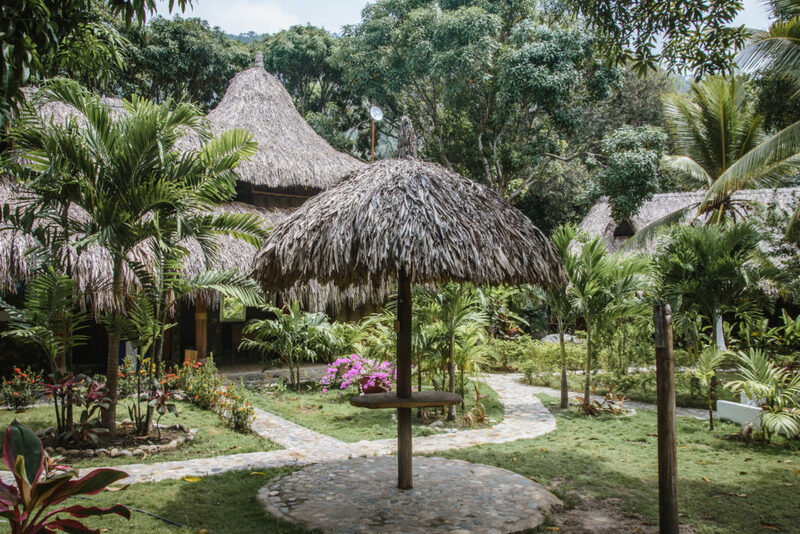 If you plan to do a day trip to Tayrona Park, you can stay in Santa Marta where you will find a good variety of hostels. There is an airport in this city and it would be also a good base if you plan to go to get some rest in the mountains around Minca as we did. 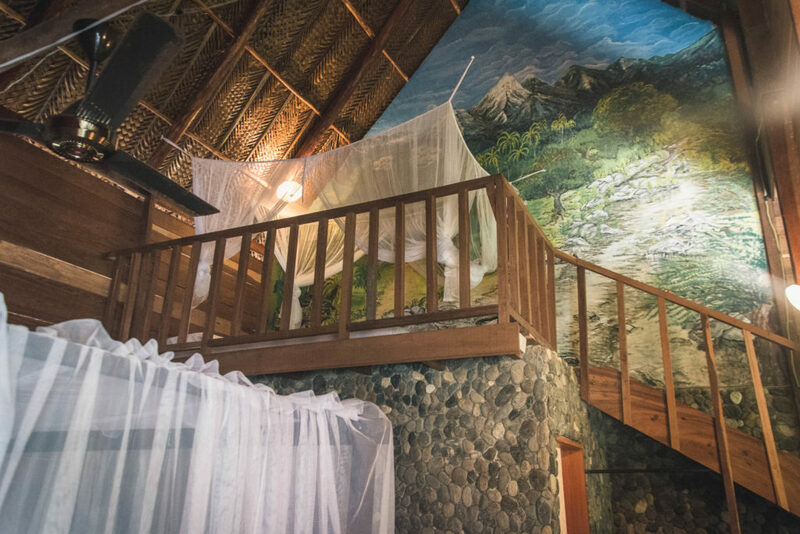 In Santa Marta, we quickly visited Masaya hostel where we left our luggage overnight when heading to the mountains and I was impressed by how nice this place was. 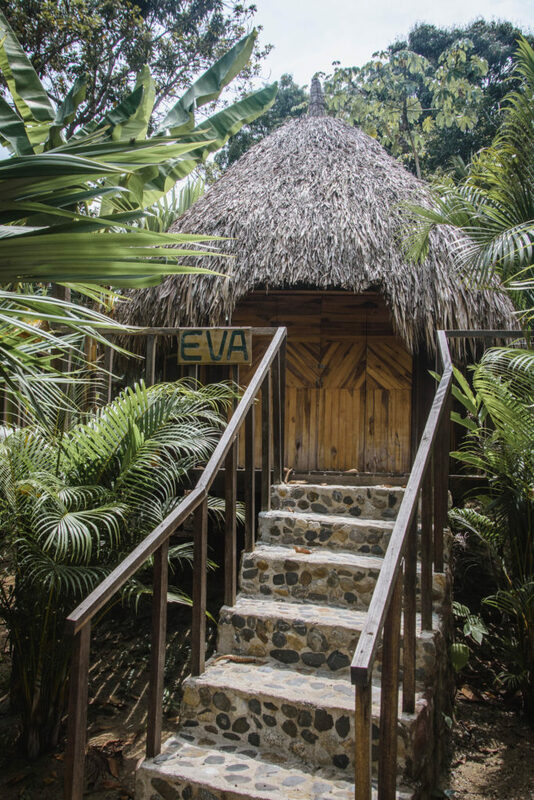 We stayed in Tayrona Paradise just a few minutes by collectivo from Santa Marta, because we just wanted to stay out of the town. 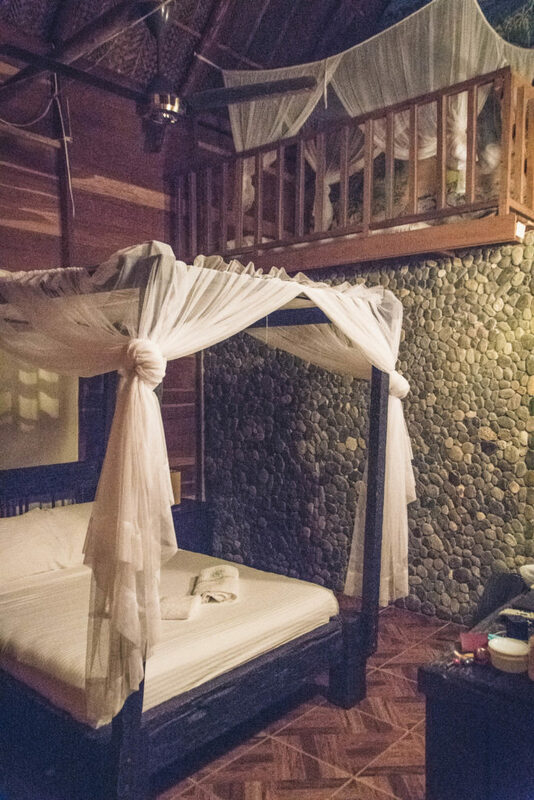 This place offers charming lodges with a lovely interior located in a tropical garden, connected with the main road by a small walking bridge. The staff was amazing, very friendly and helpful. 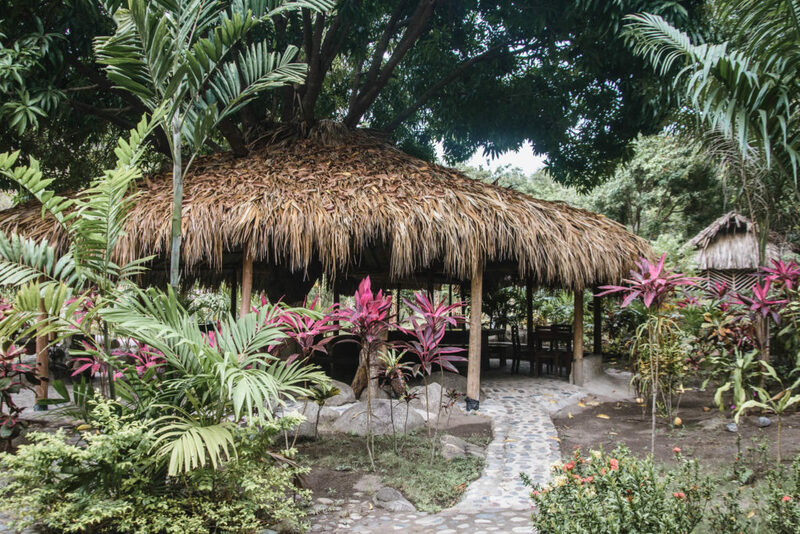 Breakfast included some fresh local fruits as well as eggs and arepas, but the kitchen can also prepare a dinner for you upon your order. 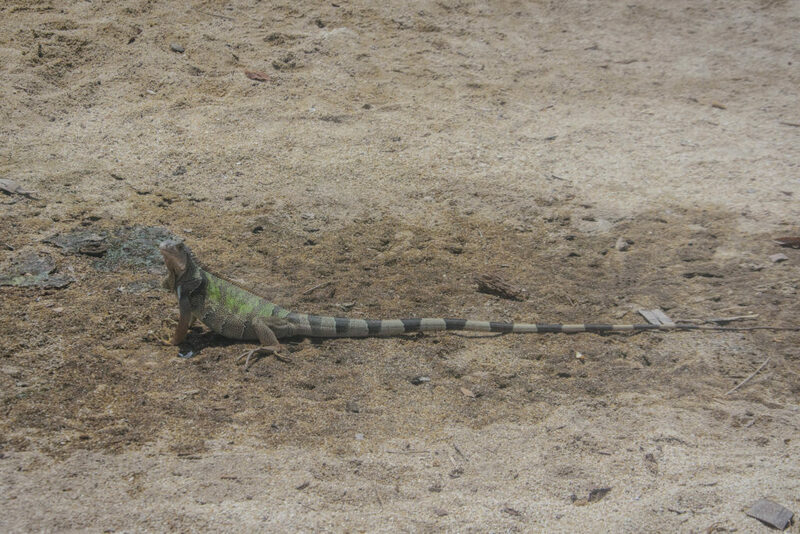 Have you visited Tayrona Park or are you planning to? 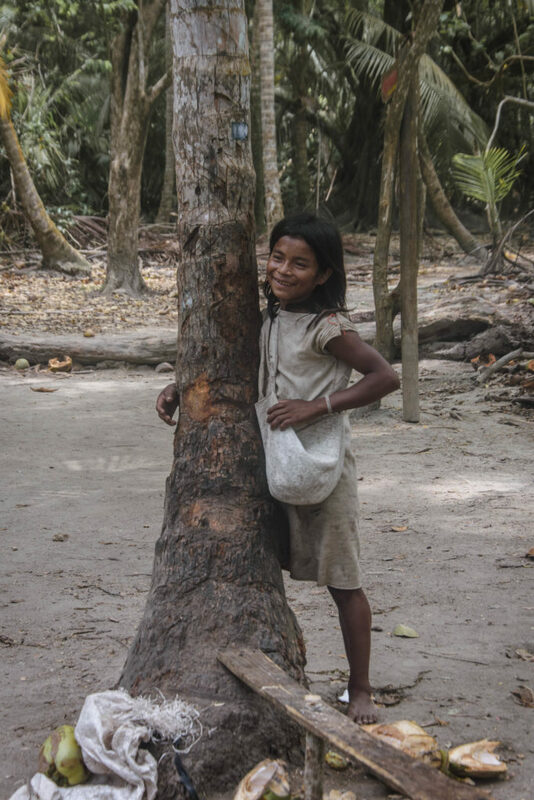 Do you know any other beautiful NPs in Colombia? Looking forward to your comments!